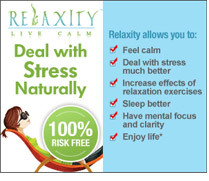 Summary: Feel calm, sleep better and deal with stress naturally with Relaxity. The demands of our jobs, families and internal pressures sometimes feel unbearable. This is a common feeling that is not easy to overcome on your own. Relaxity was formulated with you in mind. Relaxity is a natural, whole food based supplement that is made with a proprietary blend of gamma-aminobutyric acid (GABA, naturally produced) and ancient adaptogenic herbs provided in an easy to swallow capsule.